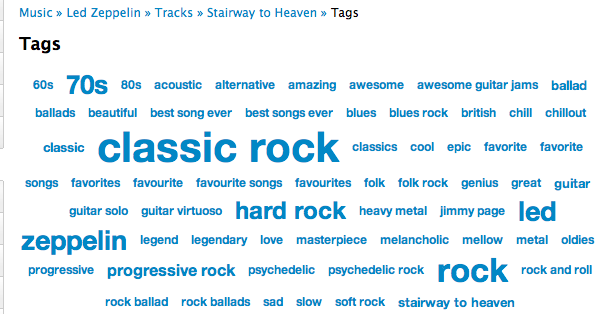 A popular track like Led Zep’s Stairway to Heaven has dozens of unique tags applied hundreds of times. 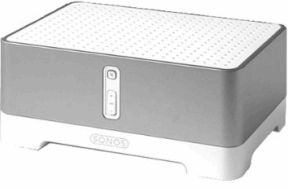 There is no end to the number of interesting things you can do with these tags: Track similarity for recommendation and playlisting, faceted browsing of the music space, ground truth for training autotagging systems etc. It is interesting to see how the subgenres like hard rock or synthpop overlaps with the main genre and how all rap overlaps with Hip Hop. Using simple overlap we can also see which tags are the least informative. These are tags that overlap the most with other tags, meaning that they are least descriptive of tags. Some of the least distinctive tags are: Rock, Pop, Alternative, Indie, Electronic and Favorites. So when you tell someone you like ‘rock’ or ‘alternative’ you are not really saying too much about your musical taste. I thought it might be interesting to explore the world of music via overlapping tags, and so I built a little web app called The Music Matrix. 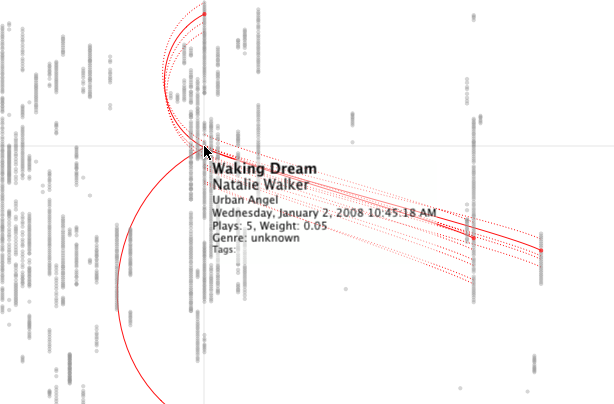 The Music Matrix shows the overlapping tags for a tag neighborhood or an artist via a heat map. 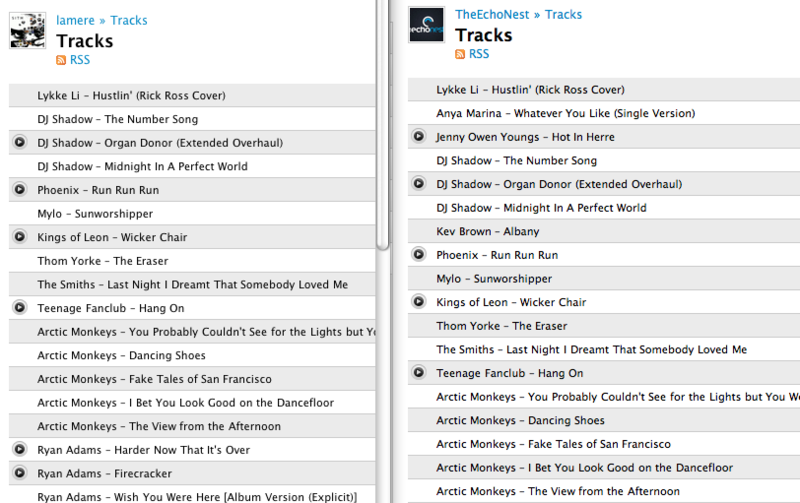 You can explore the matrix, looking at how tags overlap and listening to songs that fit the tags. The code for the Music Matrix is on Github. Thanks to Thierry for creating the Million Song Data Set (the best research data set ever created) and thanks to Last.fm for contributing a very nice set of tag data to the data set. Which band has the hotttnesss? 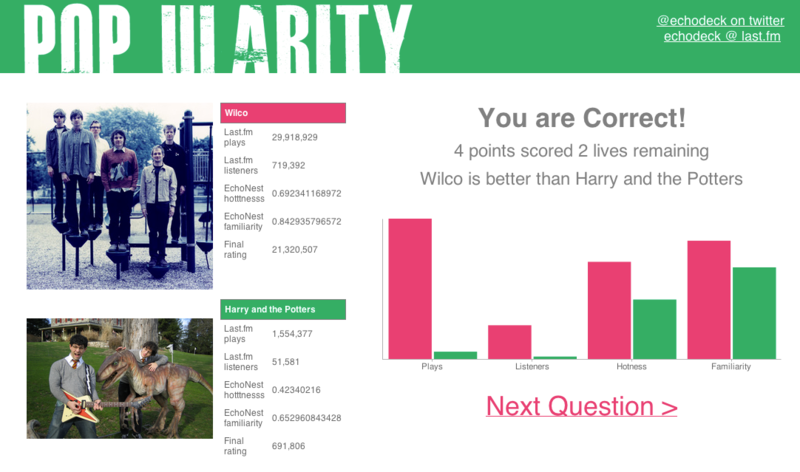 Developer/musician Paul Barrett (aka echodeck) has created pop.ularity a nifty web-based music quiz based on last.fm and the Echo Nest APIs. In the quiz you try to guess which band is hotter on the web. The quiz uses Last.fm plays, Last.fm listeners, Echo Nest Hottttnesss and Echo Nest familiarity to measure popularity for each band. I’m excited! Next week I travel to Austin for a week long computer+music geek-fest at SXSW. A big part of SXSW is the music – there are nearly 2,000 different artists playing at SXSW this year. But that presents a problem – there are so many bands going to SXSW (many I’ve never heard of) that I find it very hard to figure out which bands I should go and see. I need a tool to help me find sift through all of the artists – a tool that will help me decide which artists I should add to my schedule and which ones I should skip. I’m not the only one who was daunted by the large artist list. Taylor McKnight, founder of SCHED*, was thinking the same thing. 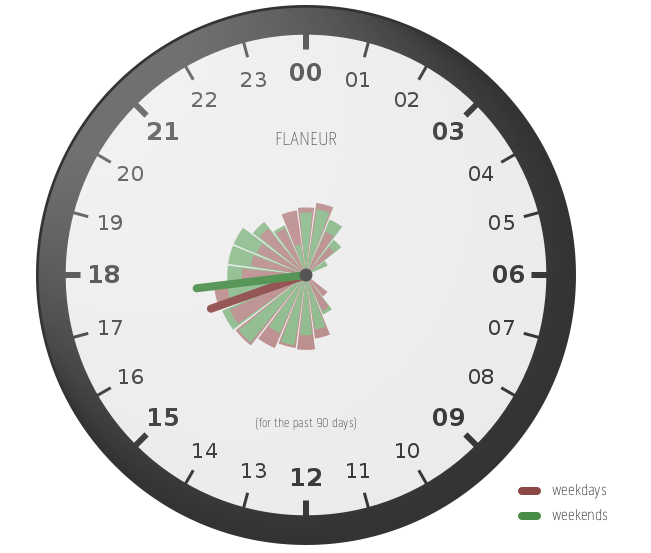 He wanted to give his users a better way to plan their time at SXSW. And so over a couple of weekends Taylor built (with a little backend support from us) The Unofficial Artist Discovery Guide to SXSW. The Unofficial Artist Discovery Guide to SXSW is a tool that allows you to explore the many artists attending this year’s SXSW. It lets you search for artists, browse popularity, music style, ‘buzzworthiness’, or similarity to your favorite artists – and it will make recommendations for you based on your music taste (using your Last.fm, Sched* or Hype Machine accounts) . The Artist Guide supplies enough context (bios, images, music, tag clouds, links) to help you decide if you might like an artist. Here’s a quick tour of some of the things you can do with the guide. First off, you can Search for artists by name, genre/tag or location. This helps you find music when you know what you are looking for. From here I can read the artist bio, listen to some audio, explore other similar SXSW artists or add the event to my SCHED* schedule. If you’ve been using the wonderful SCHED* to keep track of your SXSW calendar you can use the guide to get recommendations based on artists that you’ve already added to your SXSW calendar. Building the guide was pretty straightforward. Taylor used the Echo Nest APIs to get the detailed artist data such as familiarity, popularity, artist bios, links, images, tags and audio. The only data that was not available at the Echo Nest was the venue and schedule info which was provided by Arkadiy (one of Taylor’s colleagues). Even though SXSW artists can be extremely long tail (some don’t even have Myspace pages), the Echo Nest was able to provide really good coverage for these sets (There was coverage for over 95% of the artists). Still there are a few gaps and I suspect there may be a few errors in the data (my favorite wrong image is for the band Abe Vigoda). If you are in a band that is going to SXSW and you see that we have some of your info wrong, send me an email (paul@echonest.com) and I’ll make it right. We are excited to see the this Artist Discovery guide built on top of the Echo Nest. It’s a great showcase for the Echo Nest developer platform and working with Taylor was great. He’s one of these hyper-creative, energetic types – smart, gets things done and full of new ideas. Taylor may be adding a few more features to the guide before SXSW, so stay tuned and we’ll keep you posted on new developments.